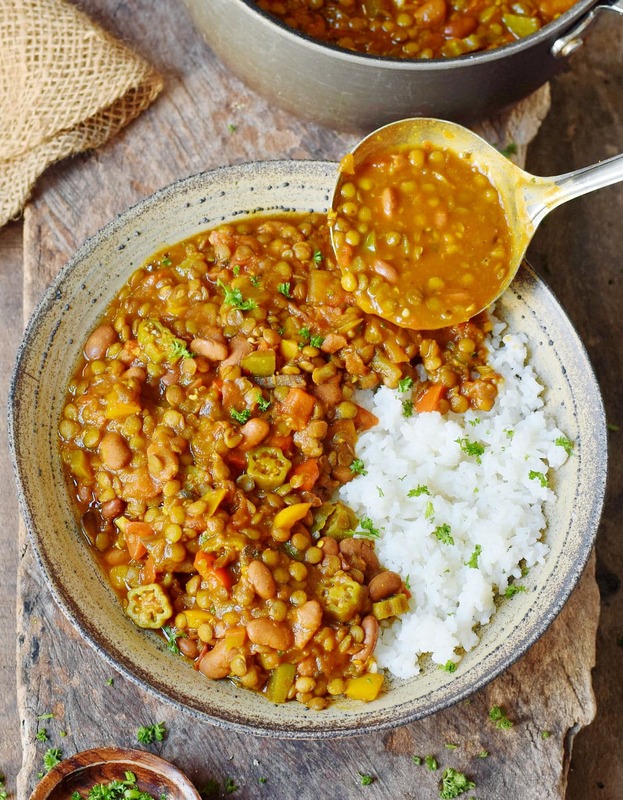 This healthy vegan Gumbo with okra and lentils is made without meat, seafood, and a roux. The recipe is flavorful, satisfying, filling, nourishing, rich in plant-based protein, and easy to make. You can enjoy this gluten-free, meat-free dinner with rice, bread or even potatoes. 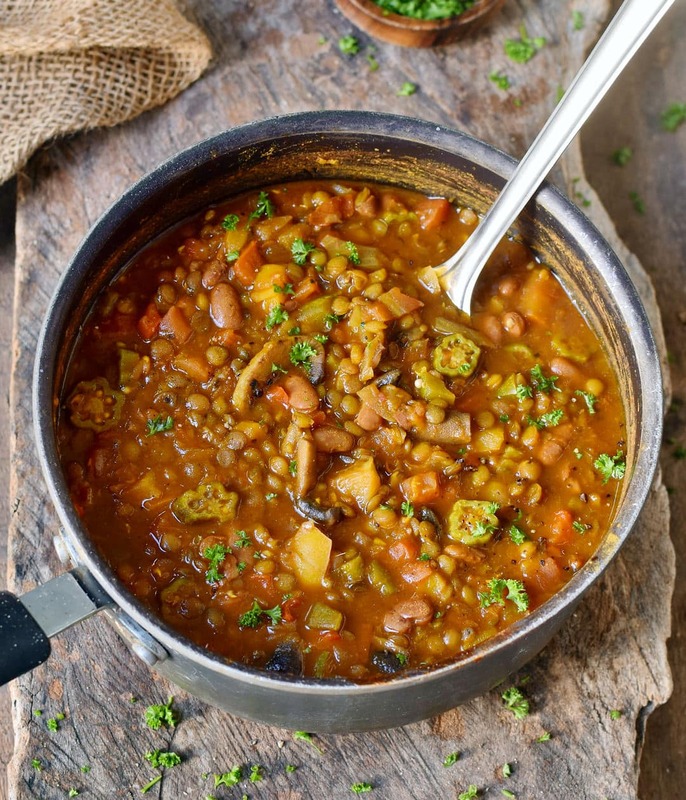 Satisfying, warming, flavorful, rich and so hearty! When you want to eat a comforting meal this delicious vegan Gumbo is simply perfect. Especially during the cold months when most people are craving warming soups and stews. But I also enjoy eating it when it’s hot because comforting dishes are my favorite! Eating a big bowl of a hearty stew is pure joy! 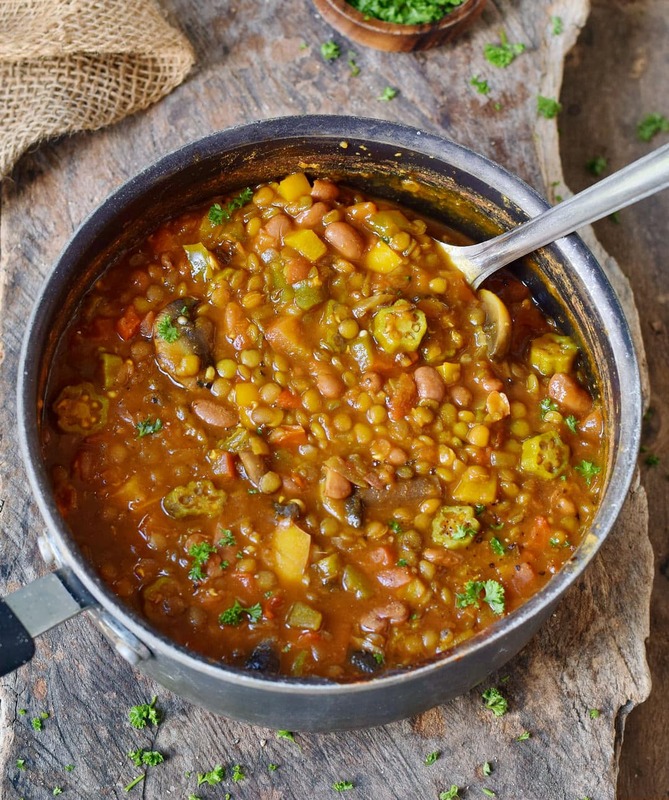 This vegan dinner recipe is made in one pot, it’s gluten-free and easy to make! This is not a classic Gumbo recipe made with meat, seafood and roux! I made my own twist by using wholesome plant-based ingredients only. Gumbo is a Creole stew which is popular in Louisiana, a South East state of the United States of America, and it’s even the official state cuisine. A classic Gumbo consists primarily of meat and/or seafood. My vegan Gumbo recipe contains lentils, beans, and what Louisianians call the “Holy Trinity” of vegetables, namely celery, bell peppers, and onions. I also added some other ingredients which add a wonderful flavor. In my opinion, there is no need to cook this dish with meat and fish. 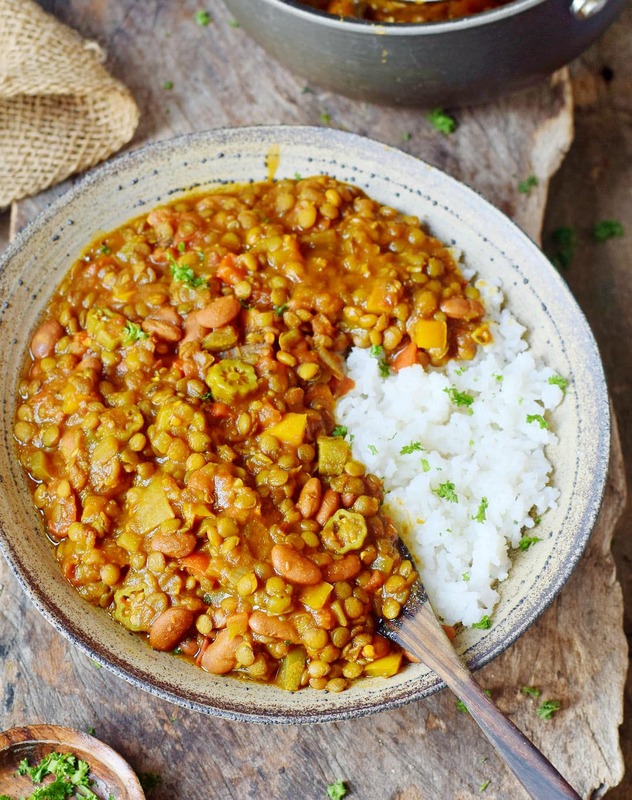 A meat-free version is equally tasty (or even more delicious) and it also contains plenty of plant-based protein because of the lentils and beans! 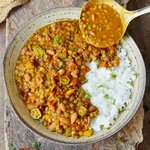 How To Make Vegan Gumbo? This healthy vegan Gumbo is seriously so easy to make. All you need to do is chop the veggies, put all ingredients in a pot and wait until the vegan Gumbo is ready. I used brown lentils but green lentils should be fine too. They might take some minutes more to cook but that’s no problem at all. You should be also able to make this recipe in an instant pot. I haven’t tried it out yet but I will soon because I am going to order an instant pot and can’t wait to receive it. I will update the recipe once I cook this meal in the instant pot. As I mentioned before, this is not a classic Gumbo recipe. I made it without a roux, without meat, sausage, and shrimp. Maybe you never heard of roux before. Roux is made with flour and either oil or bacon drippings (which is something I do NOT want to eat, especially the latter!). It’s used to thicken soups and stews and most Gumbo recipes contain a roux. I didn’t make it because, in my opinion, it’s much healthier to thicken a Gumbo with lentils and okra. 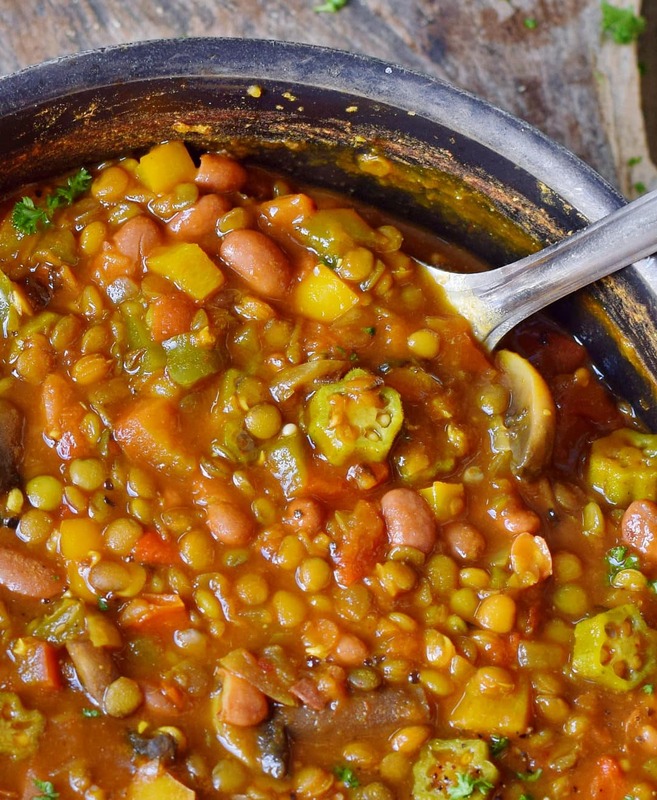 Lentils add fiber, plant-based protein, and texture, that’s why I love using them in so many recipes. I prefer to eat this vegetarian Gumbo with rice, however, it also tastes delicious with potatoes or bread. This recipe serves 4 and you can store leftovers in the fridge for up to 4 days. This dish is also great for meal prep, to take to work and uni. If you make this delicious vegan Gumbo then please leave a comment below and let me know how it turned out! And if you even take a photo of it, then I would love to see it. You can DM it to me on Instagram. Don’t forget to tag me in your Insta caption + photo with @elavegan and use the hashtag #elavegan and I will gladly check out your post. 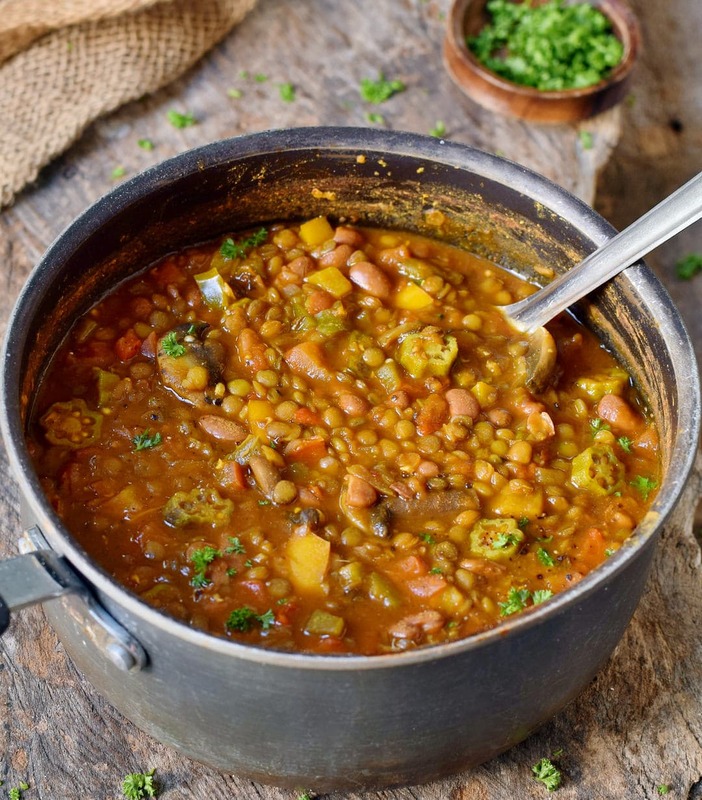 If you love hearty dinner recipes, definitely also check out this hearty lentil soup and my easy lentil stew recipe! Watch the video (scroll down a bit) to see all instruction steps. Heat oil in a pot over medium heat and add the chopped onion, celery, bell pepper, and mushrooms. Cook for 5 minutes, then add garlic and cook for 2 more minutes. Add the spices, the lentils, and broth and bring the mixture to a boil. Now add the bay leaves and cook the vegan Gumbo with a lid on for about 15 minutes. Then add the crushed tomatoes and okra and stir. Let the Gumbo simmer for a further 10-15 minutes or until the lentils are cooked but not mushy. Finally, add the soy sauce, balsamic vinegar, and the cooked beans. You can also mix 1 tsp of cornstarch with 1-2 tbsp plant-based milk and add it to the Gumbo to thicken. Taste it, if you want it spicier, add more red pepper flakes, or hot sauce to taste. Garnish with fresh herbs and enjoy! Can be served with rice, potatoes or bread. Happy to see such a lovely vegan recipes. One question, pls let me know the other options to thicken sauces?? I generally use fresh coconut cream/milk. Would be honoured to hear from you. I live in France and can’t get Okra. What would be a good substitute? That’s difficult. You could either leave it out or add zucchini/courgette instead. Thanks! I’ll try it with zucchini then! There is a lot of exotic shops in Paris to find okra. En France les Okra sont appelés des Gombos et on en trouve dans les épiceries exotiques. 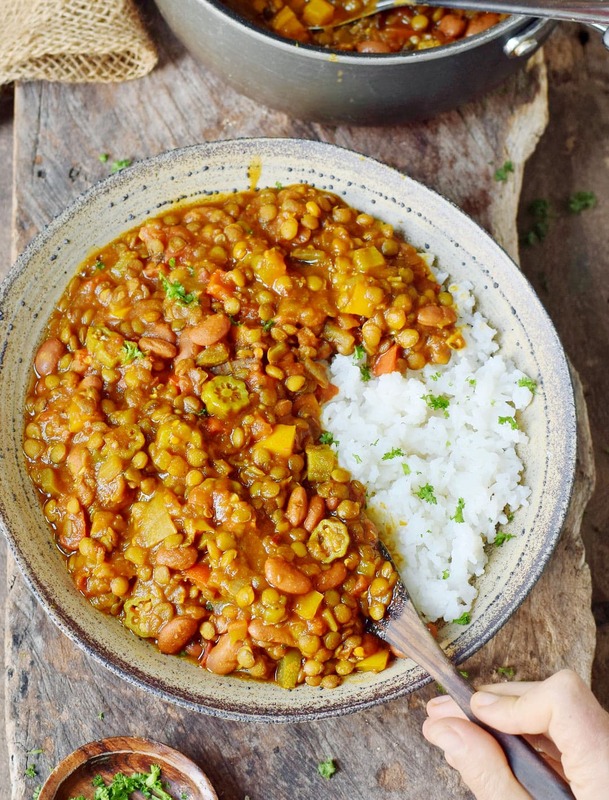 This lentil curry looks fantastic, Ela! And I love that it contains so many healthy ingredients! Definitely a great recipe! ???? I love hearty stews, they’re a hug to the soul. Will try this one for sure Ela. Thank you so much for sharing this amazing recipe. And I do have all of these ingredients at home, minus the Okra. I want to give this more than 5 stars!!! My husband and I both kept saying “Wow!” as we ate this. It is so rich and hearty and flavourful. It got the thumbs up from my teenage sons too. I have already been telling everyone about this recipe and will continue to do so! This gumbo was so yummy! My non plant-based husband discovered the recipe and asked me to make. We both loved it and he even wants it on the “make again” rotation!! Thank you for sharing your gift of healthy food creations! !